Pull files from GitLab and create pull requests from Lokalise. Use this integration to exchange files with your GitLab repository. As soon as the integration is set up, you can pull the files by using the Lokalise web dashboard. There will be also an incoming webhook set up, which you may use to automatically pull the files as they are pushed to GitLab by your developer team. Once the translations are done, you can trigger the creation of a pull (merge) request when exporting. Navigate to project settings > Integrations and click Connect under the GitLab badge. You will need to generate and copy/paste a personal access token from GitLab. The token must have api scope enabled. Next, you can choose the Repository and Branch to pull from. You must specify the platform of the files stored in this repo. As you export files from Lokalise, you can trigger the GitLab integration to create pull requests to repositories with a platform related to the exported file format. It is important to decide whether you would like the filenames to include a full path. It is not needed in most cases, as you can configure the directory structure prefix at the pull request creation (export) step. However, when you have similar files in different subfolders, e.g. admin/locale.json and frontend/locale.json, you need to enable the Include path in the filenames option. Keep in mind, that if you already have files uploaded to the project, including a path in the filenames at this step would mean that you are uploading different files. Browse the selected project and select the files you want to pull and import. 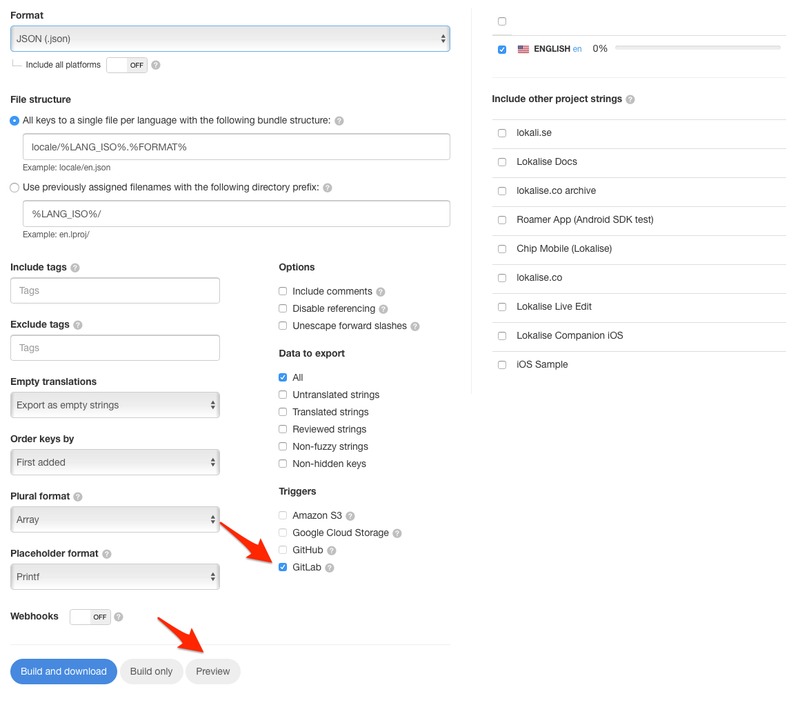 In most cases, at this step you would only need to select the base language files (the files that are being modified locally and then pushed to GitLab). After selecting a file, you must set the language of the file in the drop-down. As we recommend keeping all platform files within the same project, you may want to set up another repositories that apply to the same project. Click Add another repo to add more repositories. Use the Pull now button at the integration page (in project settings > Integrations). Hitting the button will add the pull to the system queue to be executed in the background. When you are satisfied with the initial pull results, it is a good idea to set up a webhook at GitLab which automates pulling the changes to Lokalise as you push to GitLab. 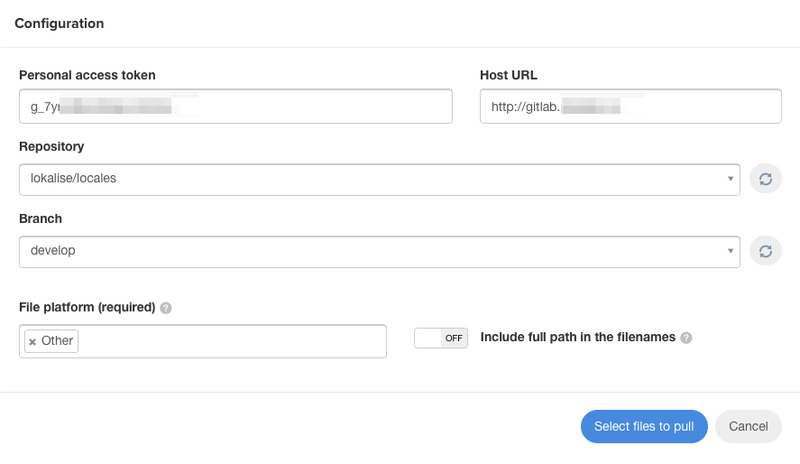 At GitLab, navigate to your repository settings > Integrations and copy/paste the Auto-pull URL provided in the Lokalise integration config. You will need to provide the Auto-pull secret generated at the integration page as well. 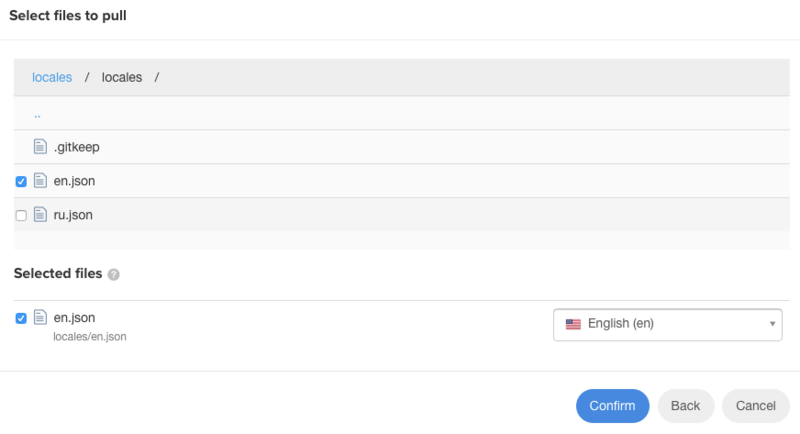 As the translations are being completed, Lokalise can create the pull requests with the exported files, which you can then merge to a selected branch. In order to create a pull request, you need to perform a project export with the GitLab trigger enabled. It is a good idea to use the Preview button first, so you can see the resulting file/folder structure before triggering the creation of a pull request. We would trigger pull requests only to the repos of the platform that match the file type you are exporting, i.e. if you are exporting JSON format, Lokalise will only create pull requests in repositories with the Web platform. A new branch is created from the last revision of the branch which you have chosen in the integration setup. The branch name would look like this: lokalise-2018-03-12_15-14-13 . A commit with all the files is created in the new branch. A pull request from the new branch to the previously chosen branch is created. You may then review and merge a pull request at GitLab. To initiate a pull request from the API, use triggers=['gitlab'] parameter with the /export endpoint. If you are using the CLI tool, use --triggers=gitlab as a parameter when performing the export.